Trash can bands make flimsy bags stay put. No more reaching into trash to retrieve a bag. Trash can rubber bands secure 13 to 33 gallon bags. Set of 3. Keeps kitty litter liners in place, too! These elastic bands holds plain bags in place,no more digging to pull the bag out of the bottom of your garbage can,buy cheaper bags no more expensive ones with plastic ties that break and are messy,I use the bags with little wire twist ties,they hold more and save money.. These are great! I had another set from years ago and the last one finally broke so purchased more from Easy Comforts because I can't do without them! I use this product on my garbage cans and it holds the bags on great. I have bought these for my 78 years young mom for years and she loves them because they prevent trash falling into the bottem of the can if the bag slipped off the top and prevents her from having to clean up a nasty trashcan as often. She really finds them very helpful. They are also handy to put around rolled up bankets and sleepingbags. Couldn't find these locally so I ordered them from catalog. Wore the old ones out. Glad to have them again as I use them all the time. Very useful for so little money. 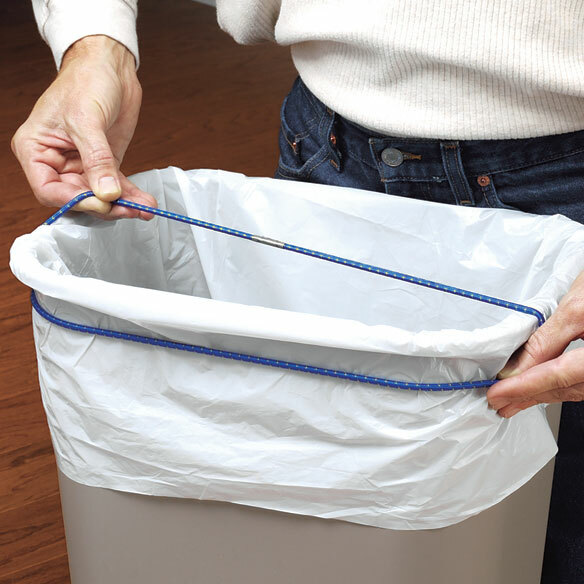 These bands are fantastic for keeping trash bags from slipping off the edge of trash cans. Makes getting ready for the dumpsters in our city alleys so much ch easier because there is no chance for trash or kitchen waste to get in between the outside of the bag and the can. I didn't buy them for trash cans. I bought them to put around large, fat file folders. Work well. Garbage bags stay in place. I have a container where my trash bag goes, then it goes inside another container. This product keep the plastic bag in place inside the container and keeps the bag from slipping inside the container or having excess sticking out of the container. Abolutely love them. I use this item to keep my trash can liners from falling into the can. i use baggies from groceries etc for my medium size basket in the kitchen and by the computer. was do happy to find that they existed. "I would buy this product again ! These are the best thing I was using regular rubber bands! They hold the trash bag in place! No more slipping and having garbage in the trash can! LOVE them! Great price too! I use this product to keep my trash can bags secured in the trash can. These bands are so good for holding bags in place. I first used them at work, then purchased them for myself and family members for home. Great price! These can bands are great. The bands really do work on keeping your garbage bag where it should be. We are using these bands in every room in our house and in our RV. No more messing around in the waste basket looking for the trash bag top...it is being held by this band. Yeah I Finally Found These! I have been looking everywhere for these! So glad to find them. I ordered for all my family! a great product to try. everything is so great about this product. dont know how i did with out it. This is just what I have been looking for and the husband even uses it. YEAH!! I use this in the kitchen to hold my trash bags snug. It does a great job. Thank goodness someone thought of this! I have a very tall kitchen wastebasket that is not terribly wide, with a lid that separates in the middle. It's hard to find good bags that are long enough. The bags were constantly "falling in" often before we knew it, creating a mess. These handy bands solved the problem perfectly and the bags hold so much more now, with no collapsing into the wastebasket! Secure it around the can and it does the job it was designed to do. So much cleaner and easier than chasing bags to the bottom of the can. Accomplishes exactly what it is suppose to do. I've been looking all over for these. I had one for my kitchen garbage bin and someone managed to toss it out with the bag! It sure is helpful to keep that bag secured to the bin and not getting scrunched down into it. Holds trash can liner in place, keeps liner from falling into trash can. I use on all large trash cans. These trash can bans really works...they keep your trash bag liners in place. Never have to worry about the trash liners slipping into the trash cans. Can be use for any type of trash cans. These bands are the best thing since sliced bread! They keep the liners from sliding down in the can, and are easy to use. I use them all over my house, and would not be without them. No more fighting the kitchen basket only to have it win. These are hard to find too so I hope Miles Kimball keeps them in their inventory. These are a bit large for smaller trash cans, but I just tied a knot in it to shorten it. Hard to find item anywhere else. I have found these large rubber bands to have many uses. Too bad they come in black or brown. The elastic can bands are useful for my large trash can. Also used one to hold my chair seat in place. Wish there were more than 3 in one package. They are great for holding trash bags in place. Good product for most kitchen/bath trash cans. holds bag in place. At Last! My trash bag stays where I put it! This THRILLS my husband, too! Great Idea! Great for trash compactors too! I use these for my trash compactor. Instead of cutting holes in the sides of the bags to slip on the white plastic disks, which takes forever, I use one of these bands and the bag never slips. Saves so much time. Exactly what we needed and were looking for, [...] happy all around!! Thank you. I'm so tired of having to pull my leaf bag up after I put in the leaves. This is a blessing. It keeps the trash can tidy and I need to get more!! Excellent for use on any mid-size to tall trash cans. I have only praise for thse rubber bands. Have not had any problems with them they have just the right give for all the different garbage cans i have put them on. These work nicely. I was able to buy the less expensive but good brand that does not have the elastic band built onto the trash bag to keep them from slipping off into the trash can. I like these, very inexpensive and easy to use and they work. If seems to loose, tie a knot; that will tighten it. Hint: Before you put the bag inside, put a bag on the outside of trashcan (if trashcan can be seen by guests you're expecting) then band it under the rim of the can. This will keep your can clean. Mine is white and in a high traffic area. Then, line your trashcan with a liner and band it. Presto! trashcan is clean on the inside and the outside. Saves a lil time cleaning.. another hint: keep extra bands of any kind in the frig or freezer. They don't tend to dry out as quickly. I use bands for pasta products in boxes. I bought one set of three and I'm already back for more. Besides using these on the garbage cans to hold down the bag, my husband has used these for other things around the house. He asked me to order more and I need a backup. Keeps the garbage bag from working it's way or sliding back into the can and making a mess. It is so neat to put your trash in the bag and not worry about it slipping down when you take it out. This is a reorder for me. trash cans. The bands hold the bags in even during high winds. These are wonderful so glad I got them. I use these trash can bands all the time & couldn't find them in the stores anymore & was so glad that I found them here & ordered them. They really do help hold the trash bag in place. Helps keep the bags from falling into the trash cans! these are perfect for keeping the garbage can liners from falling in. Great trash can bungee cords. These small trash can bungee cords are great for holding your trash can liners in place so that it doesn't fall into the trash can. They have the capability of stretching aroung at least a 60-inch trash can. The cords are very strong and haven't had one to break yet. Top quality for the price. Hard to find. Glad you had it available. Don't like handling charges. Just charge the product price rather than getting surprised at the end at the cost of a small item with handling added on. I use these on all large trash cans and have for years. Needed a couple more and couldn't find them. It is great, because the garbage bag stays were it belong. It doesn't move at all. These bands are wonderful. For years I've struggled to find something to keep the trash bags from falling into the trash can when I'm filling them. This works great and I'd highly recommend them to anyone. I used to use paper clips to hold the bag, but no longer. Wonderful invention...wish I had thought of it! Works perfectly for holding grocery store bags in place without the edges folding in to the trash container. Much neater especially when bag is getting heavy or full and easy to remove. I always had the garbage bag slide down into the can and garbage get all over the can. Now everything stays nice and clean. These bands are thick and sturdy and really stay put. They stretch easily and hold the bag great. I was so thrilled with this product I purchased another set and a set for each of my kids' homes. Great gadget. works very well to the hold the waste bag from falling down in the waste paper basket I also used some to put around a shoe box that I use for storage very happy with the product. My husband is a truck driver and we looked for something to hold bags on his trash bucket in the truck. I found these and he loves them . I bought more for his christmas stocking. I have a tall kitchen waste basket, and I cannot find bags tall enough to fit it well. The tops of the bags always want to fall over inside the waste basket. One of these bands holds the bag firmly in place so that I never have to make any adjustments to the bag until it's time to change it. I have been absolutely delighted with these bands. Sometimes the simplest products make a big difference. This is the second set I have bought. Giving this one for birthday gift. Keeps garbage bags from sliding inside the container. This product is awesome! It keeps the bags from slipping down inside the can no mater what you place in the bag. I love it! I would buy this product over and over again. These bands are great they hold the liners on the trash cans so that you don't have to tie a knot in the bag 3 or 4 times before you get it to fit. I only wish it was in colors so the garbage men would stop pulling the liners up with the band and throwing it away. Thank you so much. I have liked and used these for years. I love them! Now my trash bags don't fall into the can. Keeps trash bags in basket so it makes it easy to fill up without pulling bag down. Also, easy to empty. This product is being used on and arount all my trash cans and recliners. Perfect solution for the problem! I was getting so tired of garbage bags from falling into the trash can after I start to fill them. Didn't want to buy the expensive trash bags with elastic at the top. These are the perfect solution for this problem. Just wish they would last forever. Elastics do wear out eventually. Hopefully they won't break anytime soon! After having trash dumped on the yard or in the street when garbagemen emptied my 32 gallon cans I started putting lawn and leaf bags in them. I use these bands to anchor the bags to the can. I leave the bands on the trashcans, tie the bags once filled, and no more mess! The bands are already on the cans and ready to anchor my new bags. They also help me keep my cans clean. Keep the garbage bag from sliding down in the garbage can. and the bands hold the bags in place perfectly. This is a great invention; yes, it's basically a huge rubber band, but it works! If you have a problem with your trash bags always slipping down into the can, get these! Keeps bags from "falling" into waste-can. I have been looking for these bands for a long time - Thank You Walter Drake you have helped me keep my sanity in the kitchen!!! I got so tired of smoothing the bags back down in my trash compactor, and these bands took care of the problem I'm delighted to say. Just so tired of white tall kitchen trash bags sliding down inside of the receptical. The bands did the trick. Everything stays in place and they are not difficult to use. Mine were a bid too large for my trash can but I tied a slip knot in each which worked like a charm. Finally, no more trash bags falling into the can! I needed something to keep the trashbag from slipping down into the trash can. These work great! These bands beep my garbage bags from falling down. They work great! use to hold trash bag in place, works great!!! Keeps bags in roll-out cupboard under control so they don't get caught in the form for the baskets. Use on a variety of trash can sizes holds great! Not Just For Garbage Bags! I purchased these thinking they would hold the bags you bring your groceries and etc. home in from the store. These are definately far too large for that use. However, I was in the process of moving and they came in very handy for holding boxes, dressers and such firmly closed. If you are looking and needing something strong for larger than grocery bags, these are terrific. I do wish they came in the smaller size, too! These hold the trash bags tightly in place, no more bag slippage. Use on kitchen trashcan I keep under kitchen sink to prevent trash bags from slipping off can. Purchase less expensive bags to save money that do not have pull strings that tighten bag around can. What I needed for our kitchen (13 gallon) trash can. Also stretches big enough to fit on a 32 gallon trash can. Although the description stated that it worked on 13 - 33 gallon size garbage cans, the product is too large for my 15 gallon can. Given that, it doesn't hold the garbage bag in place, it just pops off if something heavy is put inside the can. The concept is a good one, but it's too large to be of any use to me. Too big, doesn't fit on round cans. Doesn't fit round cans, too loose. Would have liked having the three sizes that I did not get. These were far too large for the 13 gallon size trash can. Knotted it, which makes it usable, but less easy to get on and off. I bought these before, they had strong elastic this time they are very weak. Your ad did not give the size of the bands. I assumed because it was a set of 3 that there were 3 sizes. Again, you did not specify. When I got them, they were all the same size and way too big for the smaller trash cans which I wanted to use them for. These bands will only fit the large kitchen trash cans. Next time, be more specific on your advertisements! I am buying this product again as it works very well. So far this product works well for securing the bag around the trash can. Reason I am ordering again is, when the trash man dumped the trash, he inadvertently dumped the band with the trash! The band fits tightly to the trash can so he must have pulled on the bag. These help a great deal keep plastic bags in the regular and recycle cans. My mother has these, and they work great, so I thought I'd give them a try! It was inexpensive, and I needed it. Had them before I moved and need them again. I have a yard barrel that is over 27" and I need something to keep the bag from failing into the barrel. I recycle plastic bags. These will help hold them in place. Have used them in the past and they worked very well. Happened upon your site, saw them and placed an order. I have some and want more. They’re fantastic! Bags keep getting twisted or come loose. Hopefully these will keep the bags in place. Need something for my kitchen bags to stay up. We usually make our own but thought I would try something that might work better. Because they hold can liners in place. Currently using rubber bands and they tend to break. Hoping these will last longer!